I love places where you can feel the owners’ passion for their location – either by their products, by the interior or maybe also by a motivated team. At Clockers, you will find all of it. 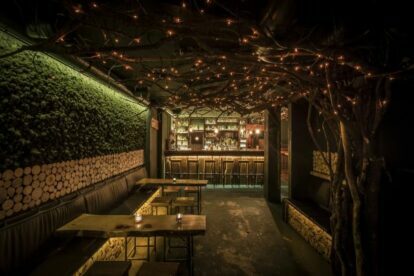 The first thing you will notice when you enter the bar, is the wonderful interior with all its little details – on the ground floor, the owners created a magical forest with moss growing on the walls, mysteriously glowing lights and a tree across from the illuminated bar. You can sit down at the beautiful wooden tables, but there is also room to dance at their parties. On the first floor, you will find a little library with classy old leather armchairs, framed pictures and shelves full of old books – a perfect spot to relax with one of their great drinks. Clockers is definitely not the place to get drunk on a low budget, but if you are looking for high quality, special cocktails or long drinks prepared by very competent bar keepers, this is a great place to visit. The cocktail menu already outdoes the variety and the specialties of most common cocktail bars, but if you have any particular wishes or simply want a surprise drink, just ask the bar keepers – with their great expertise, they will mix a drink according to your preferences. Another interesting point about clockers – they also produce their own gin, which you can buy online, and they have gin tastings almost every week.